Mokhtar Belmokhtar, a top Islamist militant, has been killed by Chadian soldiers in Mali, Chad’s armed forces have announced. His death was announced on Chadian state television but has not been confirmed by other sources. Mokhtar Belmokhtar is a former al-Qaeda leader said to have ordered January’s attack on an Algerian gas plant where at least 37 hostages were killed. Chadian troops are fighting Islamist militants in Mali as part of an international force led by France. “Chadian forces in Mali completely destroyed the main jihadist base in the Adrar de Ifhogas mountains… killing several terrorists including leader Mokhtar Belmokhtar,” the army statement on Chadian TV said. Weapons, equipment and 60 vehicles were seized, it added. If confirmed, Mokhtar Belmokhtar’s death would be a major blow to Islamist militants in Mali. Reports of the killing came a day after Chadian President Idriss Deby said the country’s forces killed al-Qaeda militant Abdelhamid Abou Zeid during clashes in northern Mali. Abdelhamid Abou Zeid – whose death is still to be confirmed by DNA evidence – is said to be second-in-command of al-Qaeda in the Islamic Maghreb (AQIM), which is fighting foreign forces in Mali. Algerian-born Mokhtar Belmokhtar has been fighting as an Islamist militant for more than two decades. He claimed to have received military training in Afghanistan before returning to Algeria, where he lost an eye fighting in the Islamist insurgency in the 1990s. 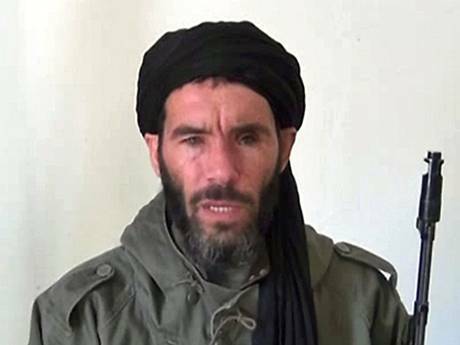 Mokhtar Belmokhtar then joined AQIM – which operates across the Sahara – before breaking off to lead his own group. He is also known as “Mr. Malboro” because of his alleged role in cigarette smuggling in the region.